It is capable of ripping multiple CDs simultaneously. This CD Ripping utility can encode audio CDs to customized formats thru user-defined encoders. 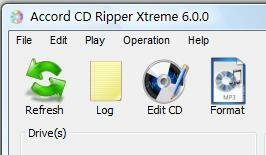 Not only rip CD tracks, Accord CD Ripper is capable of ripping arbitrary sector range of an audio CD. Secure cd ripping. Four build-in advanced disc error correction strategies: BURST, SYNC, SECURE and PARANOID. Two available actions on reading or synching an error during ripping: STOP and SILENCE. Normalize audio volume to a given percentage. This CD Ripping software supports on-the-fly ripping.